The Linear Brushed Steel Bar Stool Grey fuses a modern sense of style with a classic design, resulting in a product that will compliment a variety of rooms. A contemporary yet classic piece of furniture, the Linear Brushed Steel will not disappoint. 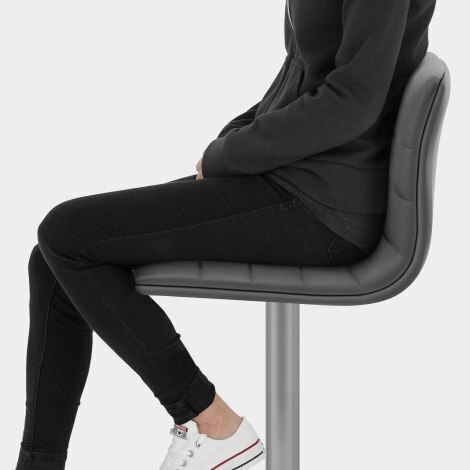 Ergonomically designed for added comfort, the grey faux leather seat is padded and boasts distinctive stitched, linear segments for an eye-catching design. The tall backrest gives support whilst the footrest below adds to this. The brushed steel central stem and base are hand finished, providing an attractively luxurious additional feature. Height can be adjusted using the ingenious gas lift mechanism that also facilitates a 360-degree swivel and, below the base, a protective ring helps to look after your floors. "They looked even smarter than the photographs"
These brushed steel bar stools tick all boxes they look fabulous, comfortable, easy to adjust, reasonably priced and look very classy. 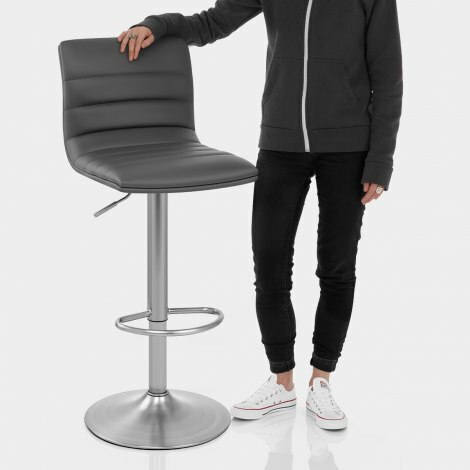 These stools are easy to assemble and are very comfortable to use. Good value for money and the next-day delivery is exceptional. Thank you. Every thing was spot on thanks. These bar stools were out of stock when I wanted them, so considered buying chrome instead, however I waited and so glad I did, These brushed chrome ones are so much classier and appear very high quality. Really nice stools. Next day free delivery. Have bought from Atlantic shopping a few times before. Never had a problem or been disappointed.